In Calabria they use a citrus fruit called a cedro in marinades and dressings, but a sweet lemon, kaffir lime or even a sharp mandarin works well in this case. Quarter 1 lemon lengthways and slice, very finely, into little triangles. Set aside. Combine the mandarin and lemon juice, honey, oregano, chilli and olive oil to form a dressing. Add salt and pepper to taste, and a pinch of sugar if the lemon is very sharp. Score the squid hoods with a sharp knife in a criss-cross pattern. Griddle or barbecue the hoods and tentacles until opaque and marked with stripes – no more than 2 minutes each side. Don’t over-cook it or it will be tough. 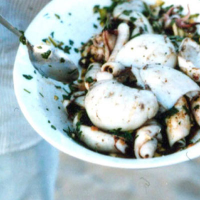 While it’s still hot, toss the squid with the lemon and honey dressing, sliced lemons, capers and chopped parsley. Season to taste and serve warm. This recipe was first published in March 2010.